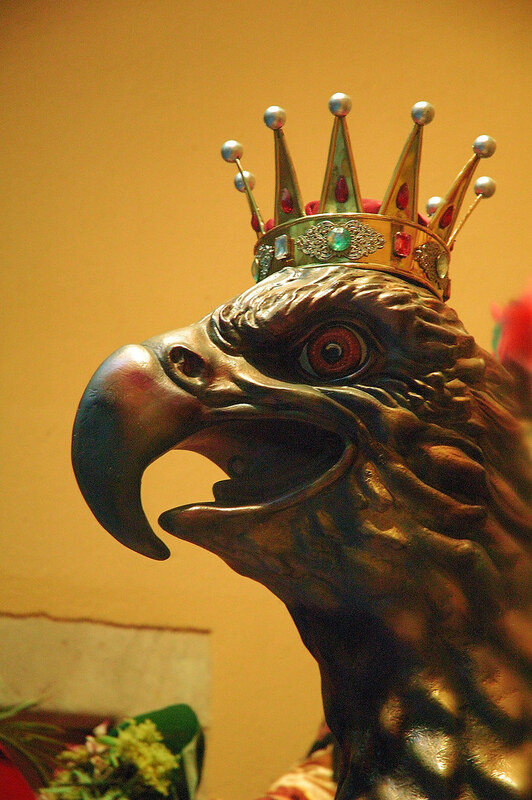 This is a detail of an eagle, the eagle that represents the city. Yes, it is not a closeup on a small adornment but a figure taller than me (anyone of course!) which can be admired among other giants in the Palau de la Virreina building at La Rambla, 99. Long ago in medieval times when theater and religion used to go hand in hand in the form of mystery plays staged in the streets, giants began to play an important role in Catalan towns. One of them was the figure of L'Aliga (eagle). In spite of not being as tall as the rest of the figures, the animal was a symbol of the corresponding city and its municipal authorities, thus the crown, and was mainly used to receive important personalities that came into town. The eagle is often holding a white pigeon in the menacing beak. There was a time when the pigeon was alive and was to be eaten by participants later on. L'Aliga is the only giant that is allowed to dance before the altar in church and there are specific procedures to observe when walking her in processions. Magnificent, simply magnificent. Thanks for the photo and the explanation. Wow, this is very cool. Beautiful colourtones and a great motiv. Nice picture Carlos, thanks for the information on where to find this lovely piece. Great weblog. Thanks my friends. I have seen that your pictures are great. Nice web Steve.